A recent inspection of a natural gas pipeline stretching across New York found that sections may have been installed without proper evaluation. Without changes, the pipeline could be at risk of rupturing. A major natural gas pipeline stretching across southern New York may be at risk of rupturing and poses a safety threat, according to a recent inspection by federal regulators. The pipeline's owner, Millennium Pipeline Co., has reduced pressure on the line, lessening the risk of explosion, but there are concerns that its problems may extend beyond a leak spotted by workers in January. —first reported Wednesday by NaturalGasWatch.org, a website that tracks gas pipeline safety—said other sections of the pipeline also appear to have been installed without proper evaluation. "Other welds with similar defects may also develop leaks and potentially lead to a rupture of the pipeline," the order says. Damon Hill, a spokesman for the safety administration, said the pipeline's operator, Columbia Gas Transmission, has until the end of the year to inspect the line and fix problems. Theresa Gibbon, a spokeswoman for Millennium Pipeline Co., confirmed the company is working with federal regulators but would not specify what measures it is taking. 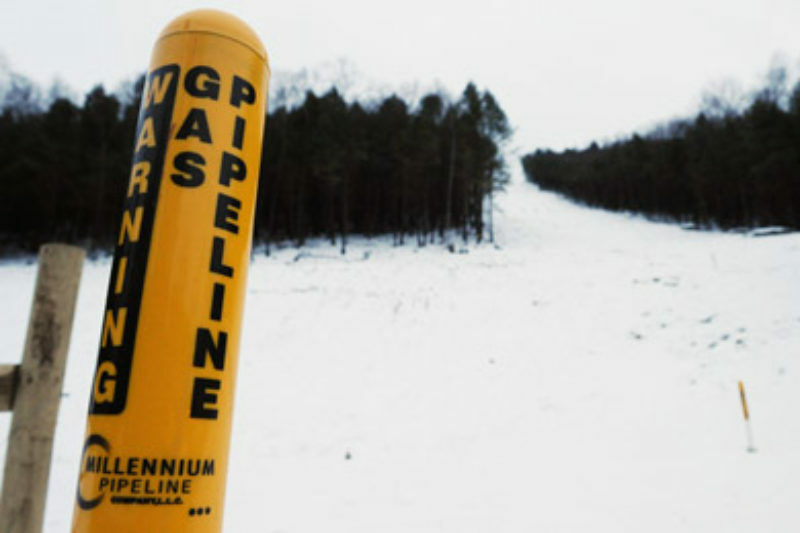 The Millennium pipeline cuts through New York's southern tier and is a potential end point of a number of proposed pipelines carrying gas from Pennsylvania's Marcellus Shale. It passes through several towns along its route. Richard Kuprewicz, a pipeline safety expert and consultant, said an explosion on the line could be significantly larger than the one that killed eight people in San Bruno, Calif., in September because the Millennium operates at more than double the pressure, even after the recent reduction. The San Bruno blast was the most deadly in a series of high-profile oil and gas pipeline accidents that have drawn attention to a lax regulatory system. A December investigation by the news organization Remapping Debate found that regulation of more than 2 million miles of natural gas pipelines across the country is largely left to the companies that operate the lines. One recent report showed that these companies have funded and shaped most of the safety studies that guide federal regulation. The number of major accidents has more or less held steady in recent years. Still, Carl Weimer, executive director of Pipeline Safety Trust, an advocacy group, said the problems with the Millennium line, along with some of the recent accidents, raise questions about whether the regulatory system is breaking down. "As we allow the companies to do their own inspection and their own engineering to decide how to deal with pipelines in the ground, the question arises, do they have enough information," he said. "This is another case where it seems like, oops, they messed up."